META-FORUM 2016 (http://www.meta-net.eu/events/meta-forum-2016/) took place in Lisbon during 4-5 July 2016. META-FORUM is an international conference that focuses on language technologies for the multilingual information society, with a specific focus on the development of a strategic research and innovation agenda for the multilingual digital single market. One of the highlights of the META-FORUM was the presentation of a number of projects, including SUMMA, in a session about “Analytics and Curation Technologies for the Multilingual Digital Single Market”. 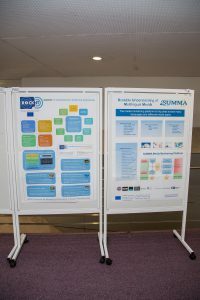 META-FORUM facilitates scientific and commercial networking and provided an excellent opportunity for SUMMA to make links with highly complementary projects such as xLIME (http://xlime.eu) and MixedEmotions (http://mixedemotions-project.eu). 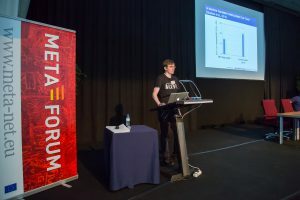 SUMMA members had a number of presentations at META-FORUM. Rico Sennrich from the University of Edinburgh had an invited presentation on “Neural Machine Translation: Breaking the Performance Plateau” in which he discussed the exciting new neural machine translation approaches which are at the heart of machine translation activities in SUMMA. Steve Renals, also from the University of Edinburgh, gave an overview presentation of the SUMMA project, as well as presenting a “Roadmap for Spoken Language Technologies”.